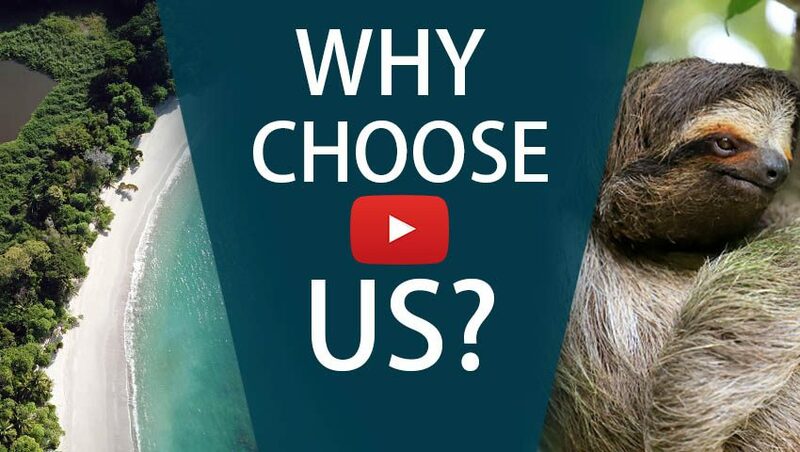 A Family-Friendly Taste of the Real Costa Rica! A great way to explore the country with kids! They will enjoy spotting tropical wildlife in both the magical setting of a mountain cloud forest and a spectacular rainforest in Manuel Antonio, set right on the Pacific coast. Transportation to all sites and tours listed in the day-to-day section are included in the package. Breakfasts, too! On-site guided tours include visiting cloud forest trails, on-site farm, amphibian gardens, and more! See the wonders of Costa Rica on this kid-friendly vacation package. Today starts your Green Family Adventure! We’ll pick you up from the international airport in San José. You can settle back and enjoy the impressive sights of the picturesque Costa Rica countryside with your family. Soon, you’ll arrive at the Villa Blanca Hotel, your home in a cloud forest! Originally built as a hacienda and owned by a former Costa Rican president, this mountain resort has many nooks and crannies your family can enjoy discovering on your own. 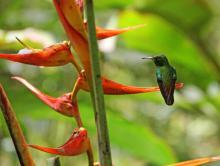 Take a guided cloud forest nature tour on one of the private trails of the villa. Your children will have a true outdoor learning experience! Delight in delicate tropical plants, birds, and other wildlife you may encounter here. Visit a wedding chapel, set on the top of the hill across the property, and take your kids to the farm to check out the farm animals, as well. After a long day, rest by the fireplace in your bedroom. A spa is also available, as well as other optional tours. Just inquire about the possibilities. Enjoy a free day to explore more of the wonders of the area. You’re going to Manuel Antonio today! Your private transfer will take you to Si Como No Resort Spa & Wildlife Refuge. This award-winning property is set on a jungle-covered hillside just above the national park, allowing sweeping views of the surroundings from every room. The hotel has a butterfly botanical atrium, crocodile lagoon, and amphibian garden. 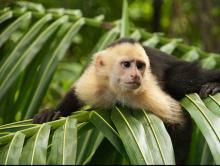 You can even enjoy a guided night tour, watching the jungle come to life as the sunset settles over Manuel Antonio. Let’s explore nature again! The kids will be endlessly entertained with abundant wildlife they’ll discover on a guided tour to the national park this morning. Your afternoon is free and we recommend you relax at the beach within the park. 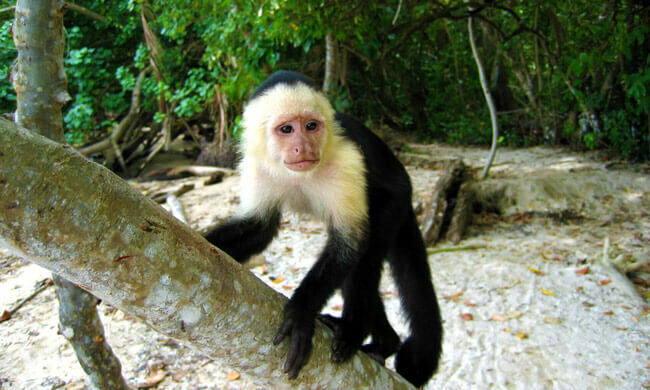 Once they show up, watching the white-face Capuchin monkeys is an unlimited source of fun. It’s time for another green family adventure! Today you’ll go on a full day tour to Santa Juana community. Learn about local history as you pass palm plantations. After an hour, you’ll arrive at a stunning lookout point, high above the coastline. You’ll then take a short van ride to a traditional, oxen-driven sugar mill where you’ll have another educational experience. 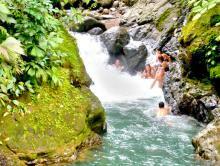 Adventure doesn’t stop here, as you will continue with a hike through the rainforest where you can swim below the waterfalls of the Rodeo River; you can also try to catch a few fish in the tilapia fish ponds. Finally, enjoy a traditional lunch back at the El Mirador Restaurant. Explore Manuel Antonio some more, or spend it lounging by the pool. Kids will have never-ending fun at the waterslide, and you can sip some drinks at the swim-up bar. Your private transfer will take you on a last scenic ride to the San José International airport. Farewell!